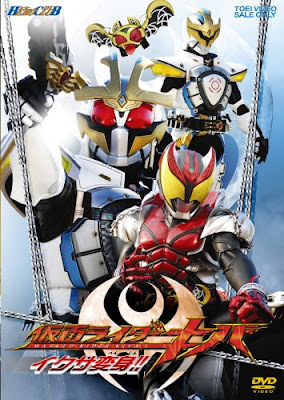 Twenty-two years after the disappearance of his father, Wataru Kurenai lives in an infamous "haunted house" where he is destined as Kamen Rider Kiva to fight life-draining monsters called Fangires, the very race his father fought years ago before his disappearance. Wataru must also deal with Kamen Rider Ixa who is part of an organization seeking to destroy the Fangire menace, as well as the Fangires' own Rider, Kamen Rider Saga. The story is split between the actions of Wataru in the present (2008-09) and his father Otoya in the past (1986-87), slowly revealing the link between the Fangire Race and Kiva. The characters of Kamen Rider Kiva are spread throughout two time periods, each related to one another. There are the actions of Otoya Kurenai and the Fangire Hunter Yuri Aso with the Wolfen Jiro in the year 1986 with the first Ixa Ver.I that result in the various Fangires that persist to the current day, in 2008, with Otoya's son Wataru (as Kamen Rider Kiva) along and Keisuke Nago (as Kamen Rider Ixa Ver.X) and Yuri's daughter Megumi (also a Fangire Hunter), dealing with the Fangires to prevent deaths. The story begins in 2008 as the Antlion Fangire begins to feed at an exhibit room until Megumi intervened as Nago arrives to slay the monster. However, during their struggle, the Mummy Legendorga suddenly resurrects and feeds on the humans before using his power to turn the Antlion Fangire into his slave to aid him in overwhelming Nago with the Arms Monsters watching the fight. While this occurred, Wataru Kurenai starts attending a local high school at Shizuka's suggestion after a welfare officer visited him and quickly befriends Natsuki Tsukue, who tries to get Wataru to join several clubs where he fails in each one while trying to ask her if she would like to start a violin club after hearing her play, she refuses out right. Later that night, death row inmate Takashi Sugimura escaped from prison and the pursuing police officers by means of a dark power possessing him, with Nago going after him under advisement from Mamoru Shima to capture the fugitive with caution as he may be a Fangire. When Nago finds Sugimura, he chases the fugitive all the way to Wataru's high school and takes Natsuki hostage, but she is freed by the joint efforts of Wataru and Nago. However, the Medusa and Mummy Legendorgas appear to Sugimura's aid when he was being escorted back to jail, overpowering Ixa as Kiva arrives. They overpower the riders until another figure named Takato Shiramine appears, transforming into Kamen Rider Rey and driving the two Legendorgas off as they take Sugimura with them, waking him as their Lord. At the cafe, as Shiramine explains the Legendorgas, Wataru finds that the current crisis started when Sugimura attempted to break out of jail by using the famous violinist Towa Sakakibara as a hostage in 1986 and broke the Legendorgas' seal. With this knowledge, Wataru asks the Arm Monsters permission to use Castle Doran's Time Door to go back in time to prevent Sugimura's actions. While trying to get Sakakibara to cancel her concert, he is stopped by Otoya who was convinced he was a Fangire and tries to beat him. After another attempt to talk to her, Wataru is attacked by Yuri after Otoya tells her about him as the police arrive to arrest Otoya on the impression he's the criminal. Forced to take Wataru in a stolen police car, Otoya is shocked when Wataru recognized him as his father. Wataru attempts to prove himself with his cellphone and money before he and his father are both sent to Kanto West Prison where Towa is to perform as Sugimura takes her hostage to escape. But Otoya knocks out a guard named Sanjou so he and Wataru can get out of their cell to save Towa and restrain Sugimura. After Wataru returns to his time under the impression he succeeded, Sanjou turns out to be the Zebra Fangire that attacks Otoya before trying to kill Towa. But Yuri arrives to allow Otoya to kill the Fangire as Ixa, causing the chain of events where Sugimura escapes and uncovers the tomb of the Legendorga Lord, invoking the spirit within it. When Wataru returns to his time, he is targeted by people under the control of the Mummy and Medusa Legendorgas, with the Gargoyle Legendorga overseeing their attack. Luckily, Otoya and Yuri arrive to aid their future children, later bonding with them before Otoya reveals that Towa Sakakibara is the stage name of Natsumi Tsukue, Natsuki's mother. Otoya is enjoying the present and its perks after disguising Wataru so he wouldn't be attacked, meeting up with Shiramine before he is distracted by a young woman named Sayaka as Shiramine tells Wataru that Kiva's destruction will soon come as Sayaka reveals herself as the Medusa Legendorga. Becoming Kiva to fight the Legendorgas, he summons Buroon Booster which he uses to destroys the Mandrake Legendorga as the Arm Monsters arrive to aid Kiva in fighting the remaining three in both their true forms and in their weapon forms. However, as his friends drive the monsters off, Kiva is attacked by Rey who reveals that he is on the Legendorgas' side as he then takes the Aso girls hostage. Later at the cafe, after Otoya plays Natsumi's song to help Natsuki finally accept her mother, Rey-kivat arrives with orders to take Wataru to the Legendorgas' castle. After knocking his father out, Wataru arrives at the castle and is brought before Sugimura, who reveals himself to be the vessel of the Legendorga Lord Arc who was defeated by the original Kiva and uses his power to force Wataru's Fangire blood to manifest into Kiva's Flight Style. Under Arc's control, Wataru is forced to have Otoya relinguish his Ixa Knuckle as Nago arrives to help. But once he loses his Ixa Knuckle, Yuri and Megumi arrive after freeing themselves and use their time-respective Ixa Knuckles to fight the Legendorgas with Otoya managing to snap his son out of Arc's spell as the Aso girls kill the Medusa Legendorga. Enraged, Sugimura decides to kill Wataru as they both assume their Rider Forms as the Ixa Knuckles are returned to Otoya and Nago who fight the Mummy Legendorga and Rey, respectively. Nago eventually gets the best of Rey, destroying him with the Ixa Judgement, while Otoya eventually destroys the Mummy Legendorga, even though his Save Mode helmet is heavily damaged in the process. While this occurred, Kiva is forced to assume Emperor Form to deal with the larger opponent, weakening him enough so he can be defeated by both of the Kurenai family Riders. However, Arc absorbs the power of the Legendorga race by sucking the eye on the moon into himself to become Legend Arc to kill them. Kiva then transforms into Emperor Form's Flight Style to fight Legend Arc in a battle across the city, until Castle Doran comes to Kiva's aid, finally allowing Kiva to perform a Rider Kick with enough force to slam Arc into the moon, leaving a gigantic crater and destroying him for good. After everything returns to normal, Otoya performs alongside his son on their violins at Wataru's school before he and Yuri return to their time. Once they left, Wataru is joined by Natsuki as the two perform a duet. Shortly after the credits, Ryutaros just finished watching watching this movie. Momotaros barges in mad because Ryutaros didn't wait for him. The two watch short cartoons films featuring the Taros themselfs. Momotaros is mad of the outcomes because he was the one that always dies and Ryutaros always comes out on top. Ryutaros transforms into Go-On Red and Ixa during the shorts. Kintaros and Urataros comes in and say they just solved the theater mystery.